Situated right on the seafront of the Ibiza resort of Santa Eulalia, the Tropic Garden Aparthotel offers 225 self-contained apartments for holidays in this popular seaside resort. Built in 2002, this modern hotel has all the facilities you would expect to find for a perfect family holiday and you will not be disappointed with your choice should you decide to stay in this 4 Star accommodation. Located only 21 kilometres from Ibiza airport the Tropic Garden Santa Eulalia has inside and outside pools, sun lounging areas, restaurant, sauna and fitness centre, tennis courts, mini-golf, children’s playground and much much more. Rooms have bathroom, kitchen, lounge, balcony, safe, satellite TV etc. Rooms are available from 54 euros (2010). Santa Eulalia is the 3rd largest resort on the island of Ibiza, and is less rowdy than some of the other resorts, it is ideal fro a family holiday. A leading holiday resort on the south coast of Cornwall, Falmouth enjoys a mild climate and boasts some excellent beaches with safe bathing conditions. The largest dock in England is located here and it takes in tankers up to 90,000 tonnes, Falmouth harbour has a dry dock and safe anchorage. Established as a port beside the older town of Penryn, in the early 17th century, Falmouth is overlooked by the 16th century Pendennis Castle, which Henry VIII built to defend Carrick Roads. Its parish church King Charles the Martyr was so named after Charles II who awarded the town its first charter. Holidaymakers arrive in Falmouth to enjoy the pleasant weather conditions, and the many attractions of the town which is one of Cornwall’s most popular resorts. Surrounded by the beautiful 18 hole Son Vida golf course, the charismatic Castillo Hotel Son Vida is one of the most popular in the area, which is in turn extremely popular with golfers due to there being 3 fabulous courses in a small area. The Castillo Hotel has 171 well presented rooms which all have the usual facilities expected of a top class hotel including bathroom, mini-bar, air-conditioning, internet, heated floors and coffee making facilities. The Castillo Hotel Son Vida located west of Palma, is housed in a building which dates from the thirteenth century, providing a unique atmosphere, making a visit to the hotel a memorable experience. The hotel itself of course has lots of facilities with swimming pool and sun lounging area for enjoying the wonderful Majorca weather, tennis courts, games room, internet, health spa, fitness centre, massage, salon and restaurant, all set in stunning grounds. The Castillo Hotel is situated within easy driving distance of Majorca airport, which is located in nearby Palma de Mallorca. From the airport you can easily obtain a taxi or transfer, or you may choose to obtain a car hire vehicle and make your own way to the hotel. A large town in Bedfordshire, located some 30 miles to the north of London, Luton, together with its nearby areas of Houghton Regis and Dunstable, has a population of around two hundred and thirty thousand inhabitants. Luton is a major travel hub for the region as it is the location of one of London’s satellite airports and London Luton Airport is handy for accessing the M1 motorway and the A5. The town is also well known for its football team who have had much success over the year. Though now a modern industrial town, Luton has a long history, with Palaeolithic remains being found in the area. In the Domesday Book of 1086, the town was recorded as Lintone, at which time it was reliant on agriculture. One of Essex’s popular coastal resorts, Clacton on Sea as a town was only established in 1871, when a railway engineer purchased some land and built Clacton Pier as a docking point for the Woolwich Steam Packet Company. The surrounding areas however, have been the site of human settlement since the time of the ancient Celts. A later Lord of the Manor of Great and Little Clacton, was none other than Henry VIII, who awarded himself the title after the execution of Thomas Cromwell (the former Lord). Clacton became a popular holiday destination in Victorian times and reached its zenith in the 1960’s, aided by the Butlins Holiday Camp, which had first opened in the resort in 1937. In recent years Clacton has fell into decline for various reasons, but not least the closing of Butlins Clacton in 1983. Still fairly popular for holidays and day trips, Clacton can get pretty busy when the weather is fine, and during the summer school holidays. At these times Clacton beach might remind those who remember, of its former heydays. A huge theme park, a Beach Club, and aquatic park and three hotels, together form the amazing Port Aventura Theme Park (PortAventura), one of the largest of its kind in Europe. Port Aventura is located in the seaside resort of Salou on the Costa Dorada coastline of Catalonia in Spain. Constructed as a joint project by Universal Studios, Anheuser-Busch and the Tussauds Group, Port Aventura later became known as “Universal’s Port Aventura”, as Universal Studios held a majority of the shares in the park. Now simply known as “PortAventura” the theme park is run by the banking group La Caixa. Despite all the other facilties, Port Aventura is best known as a theme park, located in a tropical setting, it has some pretty hair-raising rides, some of the most famous being the Furius Baco, the Hurakan Condor and the Dragon Khan rollercoaster with its 8 scary loops. The park is set out on various themes including the “Wild West”, “China”, “Mexico”, “Polynesia” and “Mediterrania”. Located in the popular seaside resort of Salou, the area benefits from a fine climate and Port Aventura weather can generally be expected to be sunny and dry most days between the months of May and October. Port Aventura can be easily reached by road, rail and plane, with Reus International Airport just 10 minutes drive away. One of the popular resorts of the Costa Tropical in Andalucia, Spain, Almunecar has a history going back to the times of the ancient Phoenicians, whe a settlement was founded there, called Sexi. Later the Romans built an aqueduct in Almunecar, remains of which can still be seen to this day. Looking down on the old town of Almunecar is a Moorish castle, reminding present day visitors of the town less peaceful times. These days Almunecar is a much visited coastal resort and holiday destination with a greyish sand beach, decent hotels, and the usual facilities expected of a modern holiday resort. The capital of Mallorca (Majorca) and of the Balearic Islands, Palma de Mallorca is home to almost half the resident population of the island, and also welcomes millions of visitors each year by way of its International Airport. The city itself has some wonderful attractions including the famous La Seu Gothic cathedral, which boasts one of the biggest stained glass windows in the world with 1,236 pieces and measuring some 11 metres across – amazing. Founded as a camp by the Romans in about 123 BC, Palma de Mallorca became an important port on the Mediterranean trade route. Known as Medina Mayurqa to the Arabs, its name is actually taken from the Roman city of Palmaria. Much of the original Roman city still exists below the present day city, and Roman remains are being found all the time. Now one of the Costa de la Luz’s main seaside resorts, Punta Umbria was originally established by the famous Rio Tinto Company (a British mining company), as a place of rest for its employees and managers. The Rio Tinto company built some colonial beach side houses there rather than the sanatorium for which they had building permission. Punta Umbria lies close to the ancient port of Huelva amidst marshy wetlands which are now a protected wildlife resort with some varied bird species. For holidaymakers the main attraction is the beaches, there are some excellent ones in the area, the closest to the town being Playa de la Mata Negra, another attraction is the wonderful conditions for water sports, especially windsurfing, as the Costa de la Luz coastline is battered by winds from the Atlantic Ocean. If you are visiting, don’t forget a trip into nearby Huelva, an ancient port which was formerly settled by Phoenicians, Romans and Moors, from Palos de Frontera, Christopher Columbus sailed on some of his voyages. Punta Umbria can be reached from Laguna del Portil or from Huelva itself. Punta Umbria Map. One of the most popular hotels in the Sotogrande region of Andalucia, Spain, The NH Sotogrande Hotel comprises 106 modern rooms which you will find very comfortable during your visit to the area. The hotel is located near to the shopping centre and sports complex of Sotogrande and is within easy driving distance of at least five fabulous golf courses, including the world famous Valderrama Golf Club. The NH Sotogrande has a terrific outside swimming pool with plenty of sunbathing areas for relaxing in the sun, its restaurant enjoys spectacular views of the Mediterranean Sea. The largest private residencial area in Andalucia, Sotogrande is a luxurious area boasting some very expensive properties and is a playground for the wealthy and famous. Sotogrande is located between Estepona and San Roque and is around 25 kilometres from Gibraltar airport. You can book the NH Sotogrande Hotel by clicking on the link below, other hotels are also available in and arount the resort. The 3 star Port Denia Hotel is located in a residential area with easy access to the sea and next to the harbour, only 50 metres from Marianeta Beach. Denia town centre is located only 1 kilometre away. All hotel rooms were completely refurbished in 2005, rooms now have en-suite bathroom with hairdryer, Satellite TV, air-conditioning/heating, safety deposit box, telephone and mini-bar and broadband internet connection. Half of the rooms offer a balcony. At guests disposal an Internet corner is located in the lobby, there are indoor activities, there is an Indoor swimming pool with Spa area, Jacuzzi, showers, mini-gym and sauna. In the gardened area outside the hotel, there is a large swimming pool for adults and a smaller one for children, a solarium and children’s playground, an area of arcade games, table tennis and pool table, there is also a bowling alley. The entertainment team will be in charge of making guests stay most enjoyable with a schedule plenty of daily and nightly activities for adults and children. Denia is located on the north of the Costa Blanca between Alicante and Valencia. 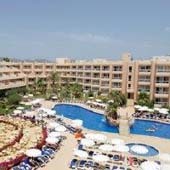 More Denia Hotels here: DENIA HOTELS. The Buenavista Hotel Denia is situated among wooded grounds and gardens, close to the hotel, guests will find Denia’s fine sandy beaches, which are among the most popular in the area. Denia town centre is full of nightlife establishments, historical sites and other diversions. There is a train which runs from Alicante to Denia in approximately 2.5 hours. There are also major roads nearby. There are 17 rooms for hire at the Buenavista Hotel, and they are spread across 2 floors. They are all provided with televisions and telephones. Internet connections are also standard at the Buenavista Hotel Denia, each of the rooms is air-conditioned and there are private baths available in each room. This hotel which is one of many Denia hotels in the resort, has 16,000 square yards of private grounds. The hotel also offers guests the use of a gymnasium, a swimming pool and a sauna. The hotel has its own restaurant, which takes some of its ingredients from the gardens located on the property. The staff can provide assistance with booking tours and other outings. Denia is located on the north of the Costa Blanca between Javea and Gandia.